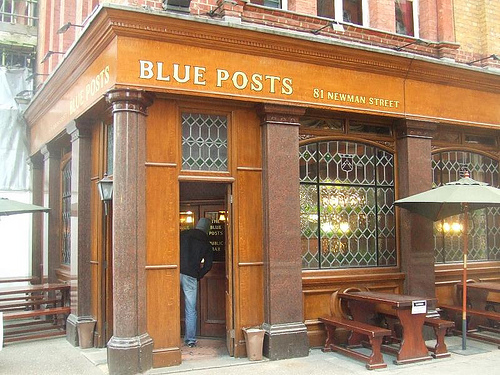 Last night, I was with a group of people in The Blue Posts, a Sam Smith’s pub on Newman Street. I was minding my business with a drink (which as it happens was in incredibly overpriced glass of Chenin Blanc) with my tablet on the table in front of me, switched off, others around had smartphones, some on, some off. The point of the tablet here is to monitor Facebook and Meetup to see when group members are going to arrive, drop out or when new members get lost and need help finding us. I and others do this in a few groups in man pubs and it’s always been great, especially in pubs with Wi-Fi. However, The Blue Posts doesn’t have Wi-Fi, so I was using my own connection. Without warning, a member of staff approaches and accusingly tells me that laptops, tablets and the like are not allowed in Sam Smiths pubs. A friend said it was off, and she calmed down somewhat and told me it had better stay off. I asked for how long this has been a rule since it’s never been a problem before, and was informed that it has ALWAYS been the case. It’s not so much the being told that electronic devices aren’t allowed, but the accusatory tone she took, as if I were doing something wrong, and the lies about it always being the case. I must admit to a concern that she would try to take the device from me. I wish she’d told me all of this at the beginning of the evening. I could have saved myself and my partner the cost of our drinks! My partner was served an off beer (as was apparently another member of our group), the wine was over priced for the quality, the food, though nice was nothing special, typical airline food if I’m honest, and significantly more expensive than the equivalent would have been in for instance, Wetherspoons. Speaking to Vicky, the organiser of our little group, it appears that this particular member of staff (who was probably a manager but it wasn’t clear) has been harassing her over various things for several months, though we didn’t discuss what, and so it’s not the first time this sort of nonsense has occurred, which combined with the fact that they consistently seem to forget our booking, frequently have nobody to man the kitchens and various other silliness smacks of more than mere incompetence. The upshot of all this of course is that I’m adding the pub to my no-drink list, and moreover will be boycotting the entire brewery. I really don’t see this changing for the better in the foreseeable future. Unfortunately, this also means that I will not therefore be attending this meetup group until they change venues, which I would encourage them to do soon, or at the very least to discuss. There are plenty of better pubs in the area to utilise, and I am sure I’m not alone in seeing the futility of staying with this one. Edit: It looks like the unofficial forum is gone. Hopefully just a temporary problem, but who can tell. To be honest I’ve never had a good opinion of them for a long time due to the food being barely eatable or not available. The beer wasn’t great either last night.